30' Fun Run Obstacle Course is our newest inflatable obstacle course for 2018. This obstacle course is made in the same green, yellow black colors as the rest of the extreme toxic line of inflatables. Two participants enter into the 30'Fun Run Obstacle Course and race through inflatable obstacles, up the climbing wall and down the slide to see who can exit first. The unit is 30 feet long and sixteen feet wide. Since it is U shaped, participants run over sixty feet to make it out. If this inflatable obstacle course is something that you want to add to your next special event, you will love the fact that participants enter and exit at the front which makes it very easy to watch. 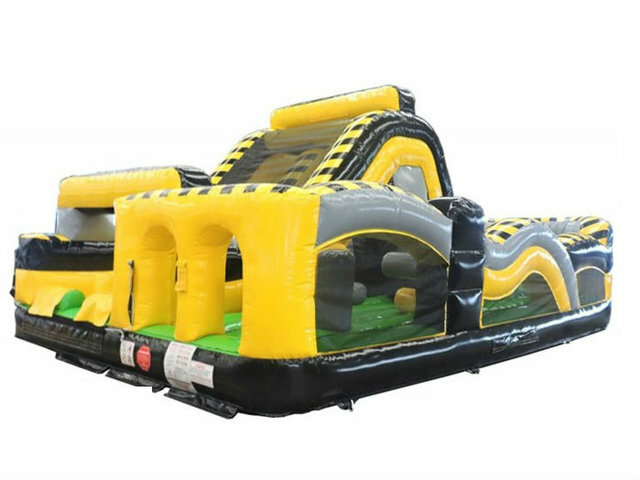 An advantage to this combination is that it allows you to add an extreme inflatable obstacle course into a smaller space. With the entrance and the exit being on the same side, the obstacle combination can be pushed against the wall which means you only need room for the exit. This combination will challenge even the most adventurous. Give Jumpolines Party Rentals a call today and let us help you plan your next corporate event, college event, after prom or any special event (801)808-7085.